So I had an unexpected incoming on Sunday. I was in Brent Cross and popped in Fraser Hart. They had received a fresh delivery the previous day, and this white grape OP 36mm was freshly sat in their display. I tried it on, it was a perfect fit on my 6.75" wrist, I loved the colour and variety of the dial and so I decided that I may as well pick it up! So I now have a 3rd Rolex after my Hulk and BLNR, and something a little bit different. With the size, mix of polished and brushed surfaces, it really is both a perfect everyday watch and dresses up and down very well. This really could be a genuine one-watch contender if I ever slimmed down the collection (unlikely!). 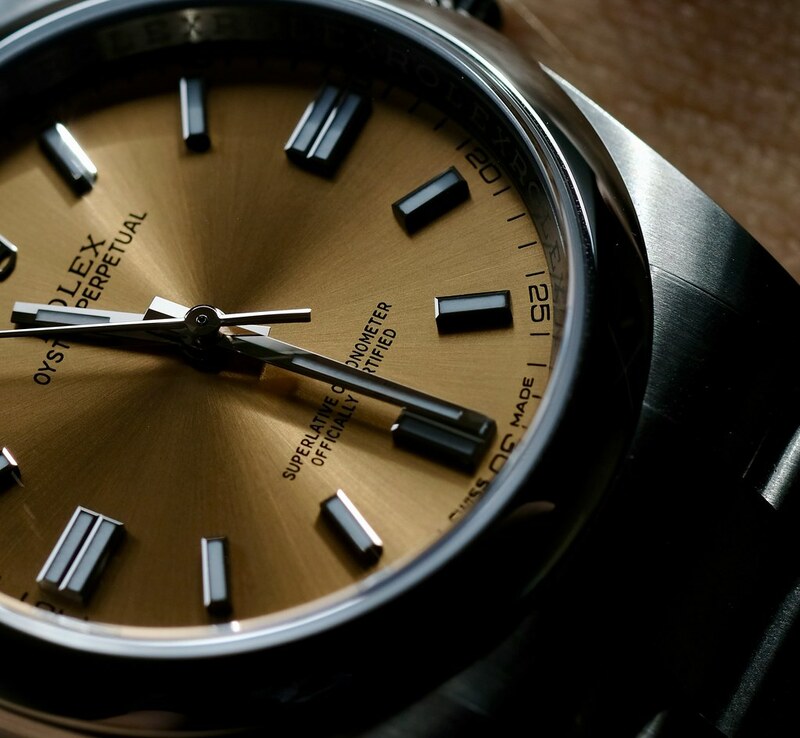 As the "basic" Rolex, the quality of the dial and finishing is excellent. And given the feature set and price (£3900) it compares very well against offerings from Omega (the Railmaster or AT) and is so much better value than entry-level IWCs and the like. Anyway, I am super pleased and can't see this one leaving the collection anytime soon, although it means I may have to rotate at least one other piece out. I have a few photos below which hopefully show off the superb sunburst dial, which is probably my favourite aspect of the watch! One of my favourite Rolex models, the natural sucessor to the old Air King model IMO. Simple understated class. 36mm is plenty big enough for most folks too, despite the current big watch trend. I tried one of these on a few days ago and it certainly wore bigger than the 36mm Explorer 1 I was wearing, the squarer cases have that effect. Very nice watch at one point was considering this however I got offered a BLNR and purchased that instead. So I now have a 3rd Rolex after my Hulk and BLNR, and something a little bit different. With the size, mix of polished and brushed surfaces, it really is both a perfect everyday watch and dresses up and down very well. This really could be a genuine one-watch contender if I ever slimmed down the collection (unlikely!). 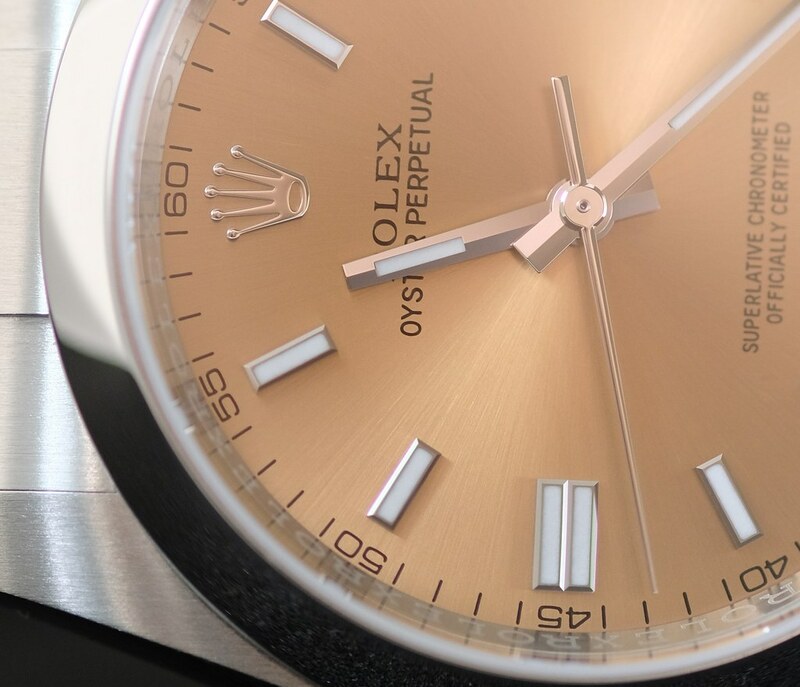 As the "basic" Rolex, the quality of the dial and finishing is excellent. And given the feature set and price (£3900) it compares very well against offerings from Omega (the Railmaster or AT) and is so much better value than entry-level IWCs and the like. Great looking watch, love the dial colour. You refer to it a as a “basic” Rolex, presumably a reference to the price but is there any discernible quality differences between this and your other Rolex watches? In its 36mm guise its probably my favourite Rolex although I prefer the white dialled version. Saw one of those today, I was very tempted, great watch and pics! It’s the “entry” range, but there is absolutely no quality difference, just less features - e.g. no easy link, glidelock, trip-lock crown or bezel you get on some of the sports watches. It’s every bit as well made as my hulk. Lovely watch & one I’m seriously considering instead of Sub, mind you it’s the 39mm black dial. Just need to try one on. Nice pick up and they seem good value comparatively (everything's relative!). I've just swapped from my SD which I only wore for the afternoon to my 14270 Explorer and it always feels like a ladies watch for the first few minutes.... then it feels like the perfect watch. I only have a 6.75" wrist but there's plenty of space in any collection for a hefty tool watch and something c36mm for that vintage/classy/any event feel. Purchased one for my wife, none of her other watches gets a look in now. It just looks "right". I have the 39mm red grape , fantastic all rounder. Beautifully balanced dial without the date, congratulations on your latest acquisition. Yeah, that's the variant that I like. It's really nice, everything on the dial just works so well - a proper simple watch. I also like the subtle vintage air it's got about it, which only comes with products that have been carefully refined over a long period of time by people who understand what they're doing. Super watches. Solid bracelet and clasp and a wonderful dial layout make it a popular watch in the line up. I have one of those (albeit on SC now) and have to say I think they represent excellent value for money in the Rolex line up. Understated class is the only way to describe them. Now that's a proper Rolex doing proper watches properly! I like the double batons on these 36mm OPs that are absent on the other sizes... but for me a smooth bezel datejust would always offer that extra usability as a daily wearer. Love these and have come close more than once. The dial gives off a vintage vibe but the relative thickness and width of the case just looks solid and modern. Prefer these to the 39mm size personally. I felt the Black 39 looked bland relatively speaking. Would you go an extra step and consider a Turn-O-Graph? 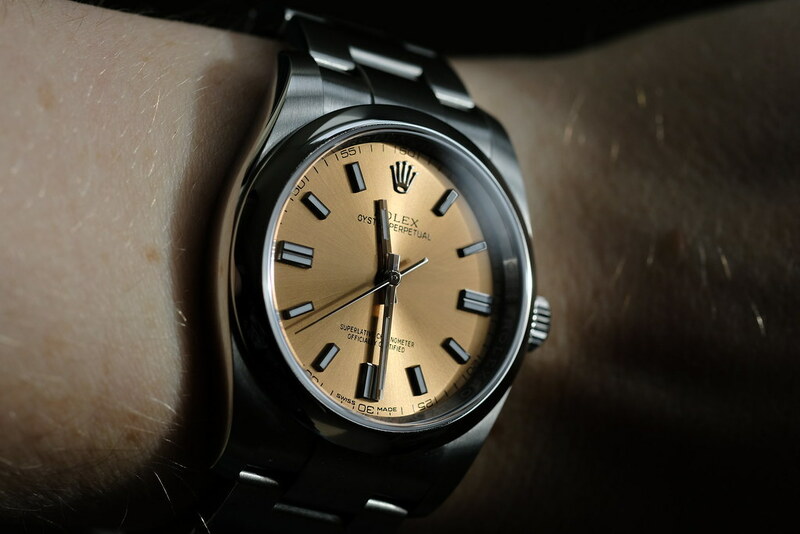 If I was in the market for a Rolex, I definitely would - I need the date and hence the DJ, but I've always found that a plain bezel doesn't quite do it for me, and the fluted one is a bit too dressy. The Turn-O-Graph is thus perfect because the bezel has a slight toolish slant, and it's also functional. I have the Blue dial version, it's the only watch that I want to wear now. Apologies to the OP for going off topic. Turn-o-graphs are a bit of an oddity really. 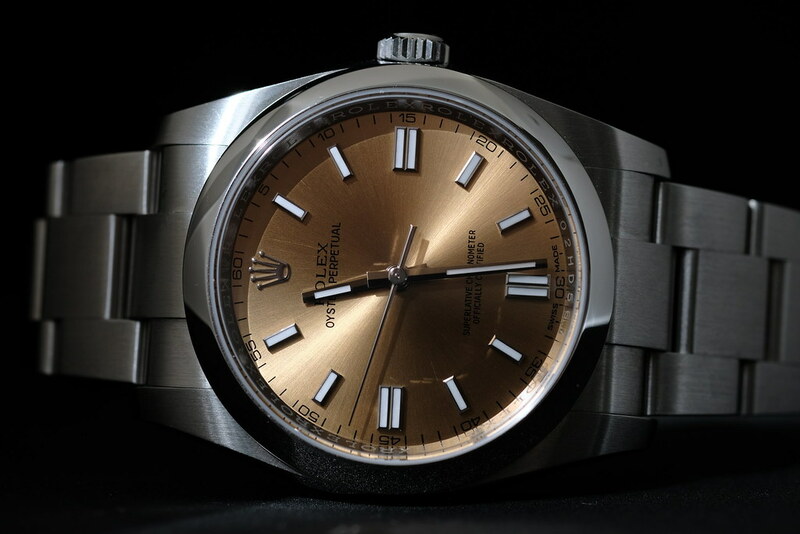 In theory they are great, adding the utility of a timing bezel to the sleek lines of a datejust - but in practice they are less useful than a sub and less good looking than a regular datejust. Just spotted this thread and its pretty apt for me. Ah, so you’re the lucky guy who ‘s bought it! Thought about this one for a few days, decided to go for it, only to find it’s sold. If you’ve got experience with the 34mm version I can’t see you suffering buyer’s remorse on this one, and the blue dial’s simply superb. 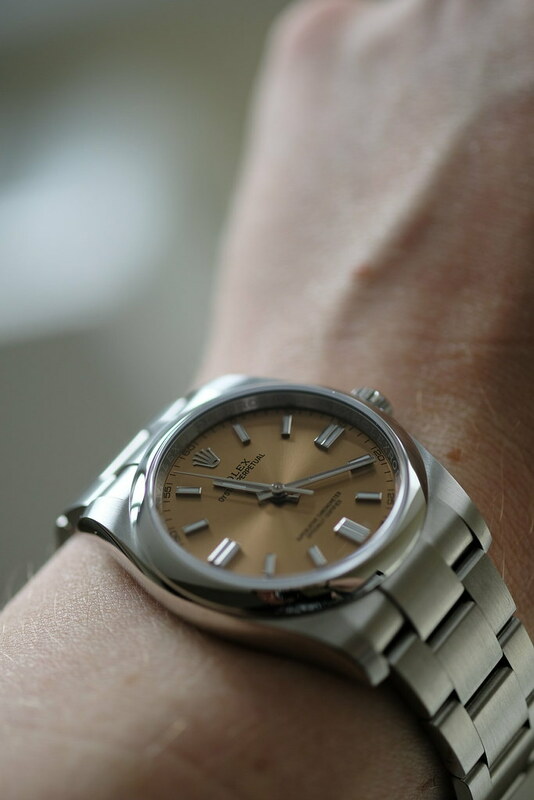 Had a 34mm Air King with the same design several years ago, it’s a classic. Enjoy it.....I’m sure you will.